Two Story Retreat with a King Bed! Step inside the courtyard and begin to relax as the traditional adobe walls surround you in this charming, two level, one bedroom retreat. 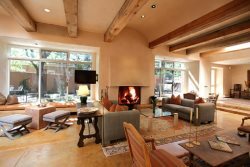 The garden level has a private landscaped patio where you can sit back and enjoy the beautiful Santa Fe climate. On the ground floor level you will find a newly remodeled kitchen, living and dining areas. The upstairs level is a wonderful sanctuary! A large bedroom with a king-size bed, sitting area and en-suite bathroom invite you to settle in for a long stay. Windows surround you on all sides with summertime views of leafy treetops and wintertime glimpses of snow covered mountains. Two kiva fireplaces add to the overall charm of the unit--one on each level! The unit is located inside a charming compound of eight condominiums alongside the historic Acequia Madre. Steps away from the front door, enjoy the shared area shaded by giant old cottonwoods as sounds of water run through the Acequia! Walk across the street to Downtown Subscription where you can enjoy morning coffee. Take a short walk down Garcia Street to Canyon Road, just 2 blocks away, where you can browse Santa Fe's best art galleries or dine at one of its finest restaurants. Venture out to the historic downtown plaza which is only a short 4 blocks away and enjoy restaurants, bars, shopping, Kaune’s Grocery Store, museums, and more! At this marvelous location situated in the heart of Santa Fe's historic eastside, you will find it very easy to leave your car behind as well as the stress of everyday life! Super experience from the first contact to check out! Your wish is their command! You get what you want: quiet and remote or in the center of the Santa Fe action, Casas will find it for you. I can't wait to use Casas to rent our home when it is ready summer 2017. Wonderful experience! We sincerely appreciate your high-quality attention to detail!